If you are looking for an easy pulled pork recipe, you’ve come to the right place. Now I am not, for a minute, claiming that this is better than the hundreds of other recipes for pulled pork there. There are those who have worked tirelessly on their own rub recipes, experimented with types of wood, smoking times or basting sauces, and generally suffered for their bbq art. I respect those people, and I certainly want to eat with those people. But that wasn’t for me. I don’t have a smoker, I don’t have patience, and I have two children so I can’t tend to a piece of meat all day, no matter how much I want to. This led me to research “oven pulled pork” and found that most of them had three things in common: 1. Rub the night before 2. Cook for 7-9 hours on a low temperature (250-300 degrees) 3. Use some kind of sugar. With this in mind, I put together my own pulled pork recipe. It could not be simpler. The day/night before you’re going to cook it, I used the Divine Swine Rub, that’s available from their web site or Whole Foods. The thing about BBQ seems to be that a dry rub must actually be rubbed into the meet, so be prepared to get your hands porked. When you’re done, wrap it in plastic wrap and put it away. Forget about it. Don’t think about it. The next day, I chopped up one vidalia or yellow onion, a few stalks of celery and a carrot. Place them in the bottom of a dutch-oven. I have a 6-quart Le Creuset. Don’t fret about slicing or chopping or dicing; I have traditionally discarded the cooked vegetables afterwards. Using a little stand (I am using the little metal prop that came with my wok to uphold the stream tray), place the pulled pork above the cut up vegetables. Then, pour the entire bottle of root beer over the pork. Seal/cover the dutch oven with two sheets of aluminum foil. Place into the oven at 300 degrees for about 8 hours. (You can put it in at 250 for 9 hours if you’re going to be away longer). When done, remove the cover. The fat can easily be lifted off, and you want to then put the meaty pieces in a separate oven-safe dish. You may note that the meat “pulls” apart very easily. I use at least one fork for this process, and pull any big pieces into smaller strands of meat. 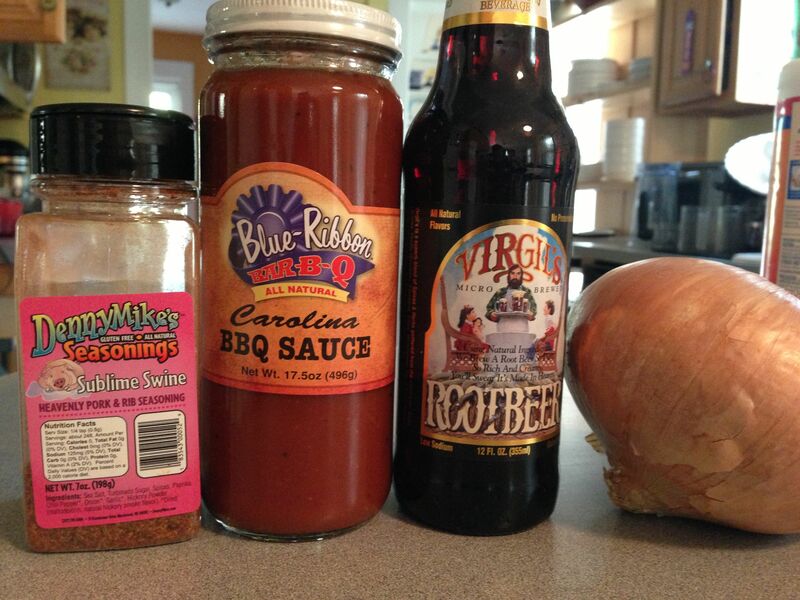 When done, ladle or pour the BBQ sauce over it, and mix. Keep warm, 170-200 until serving. Right before serving, add more sauce to moistness preference and taste. Every time I serve this, it has been a big hit. It keeps well (for sandwiches the next day) and with its low cost per pound, it is a very economical meal. I serve it with cole slaw, slider buns, pickles and maybe a starch like chips or rice. Enjoy!